Cody and Meg were inseparable.Two peas in a pod.Until . . . they weren’t anymore. Ah, Gayle Forman...You sure know how to make a girl cry! I easily could have read this book in one sitting if I wasn't trying to purposely drag it out. Have you ever done that? Willingly drag out a book because you don't want it to end? Almost like you are savouring it? 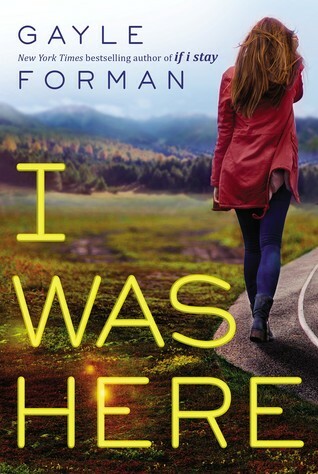 That's exactly what I was doing with I Was Here by Gayle Forman. The wonderful author who brought us the epic If I Stay and Just One Day books. Gayle Forman is known for penning emotionally charged novels. Each one had me reaching for the Kleenex constantly. Gayle Forman is also known for crafting outstanding characters. Characters that nestle their way into your hearts forever; Cody, Meg, Ben, The Garcia's and every other character in this book are no exception. You not only become emotionally tied to the main characters but with the entire character cast! Cody's character is not one that is put out on the table for all to see right off the bat. We learn of her deep friendship with Meg, but not too much about her. Her character and her emotions over her Best Friend's death unravel throughout the novel. Almost as if we are experiencing the stages of her grief right along her side. It made for a very raw yet realistic read. Gayle Forman is also a master when it comes to Male characters. They all seem to have an almost boyish exterior but a much deeper, more vulnerable interior. Ben, of course, falls under this category. And not to mention, he is totally swoon worthy! I adored his character from his first introduction. And Meg, dear Meg. Although we only learn of her character in past-tense she has a strong presence. Almost as if she was looming over your shoulder, hauntingly, as her story unfolded. I Was Here was nothing short of amazing! You will want to devour it and savour it all at the same time. You will want to fly through the pages yet hold off from turning them. Another spectacular novel from Gayle Forman in the books...Like what I did there? I enjoyed this one :) 3 star read for me. I must concede there's something engaging around a was-it-suicide-or-was-it-homicide plot finishing with it really being suicide.